Just because an actor is good, doesn’t mean the film will be. Michael Caine had Jaws : The Revenge. Johnny Depp had The Ninth Gate. Robert Downey Jnr had Due Date. (Oooh, I know I’m courting controversy with some of these) And you’ve got For Love or Money. Or The Concierge. It’s ok, Michael J Fox, you’ve got enough good stuff that we can forgive you this one. 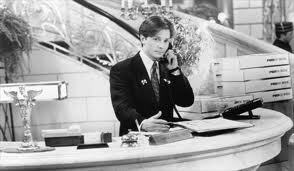 Doug (Michael J Fox) is a concierge at a big hotel. He gets things done and is loved by everyone. Well, almost everyone; the taxman doesn’t like him that much, and neither does his boss. But Doug has two things on his mind; his future, with a project to renovate a beautiful old building into a new hotel and Andy (Gabrielle Anwar), the beautiful woman who is a perfume counter worker by day and a jazz singer by night. But, to his distress, he learns that Andy is involved with a married man. And this married man is Christian Hanover (Anthony Higgins); the entrepreneur about to bankroll his dream. What can he do? The plot is weak and the characters are poorly written. It feels as though it should have the slightly slapstick comedy of many comedies of the eighties, but it just misses out. In fact, it is just boring.